There are some foods that once you try, you just can’t get out of your head. For me, one of those foods is the Mighty Cone from Austin, Texas. 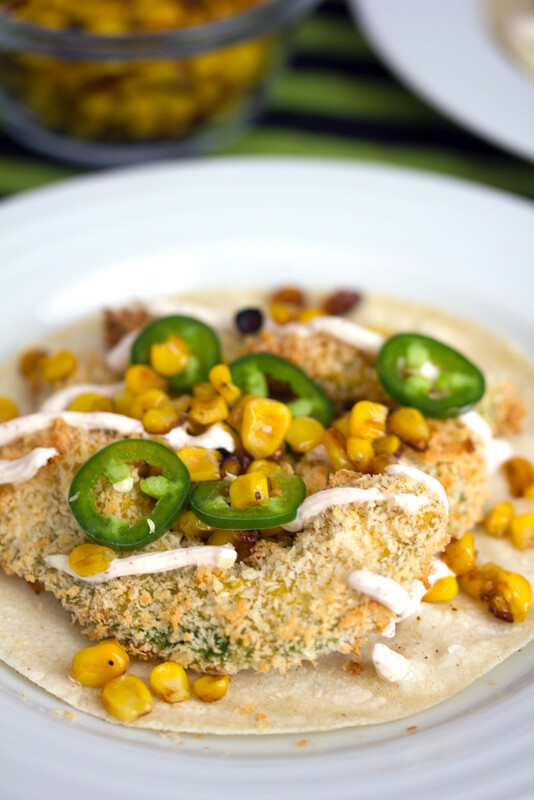 I first tried it when I was at Austin City Limits years ago and from that point on, I’ve been dying for a taco filled with fried avocado, jalapeños, and other deliciousness. Here I am back in my younger years (with bangs! And a romper! 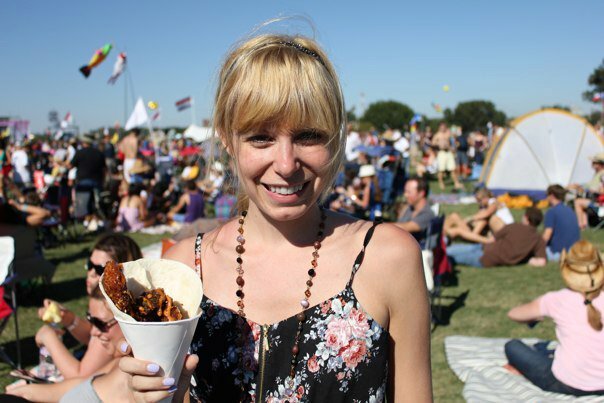 Biggest music festival faux pas ever right there) seriously excited to dig into my Mighty Cone. I had no idea what I was about to consume. 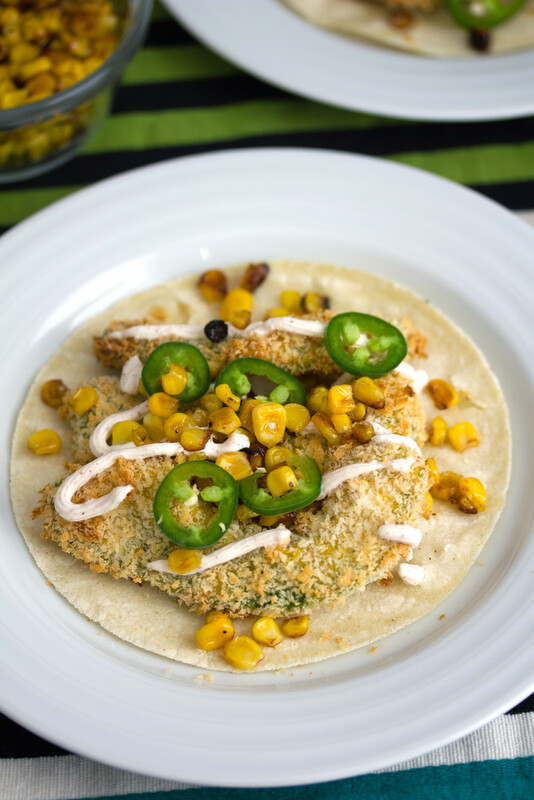 These Baked Avocado Jalapeño Tacos were inspired by the Mighty Taco, but are a whole lot healthier. I mean, I’m actually going to go to the extent to say that these tacos are mighty healthy. Because as much as one may want to, one cannot live off of fried avocado and mayonnaise alone. Sob. But baked avocado? And avocado tacos? That’s another story! I’ve always been an avocado fanatic, but now that I know it’s totally healthy and fabulous to eat an entire avocado a day, I feel like my life has changed. The difference in this recipe is that my avocado is baked instead of fried. I sliced two nice and ripe avocados. This recipe, from start to finish, is pretty simple. A whole lot simpler than frying. You’ll still want to go through the dredging process (pretty sure I’ve mentioned it before, but DREDGE is such a good word!!). 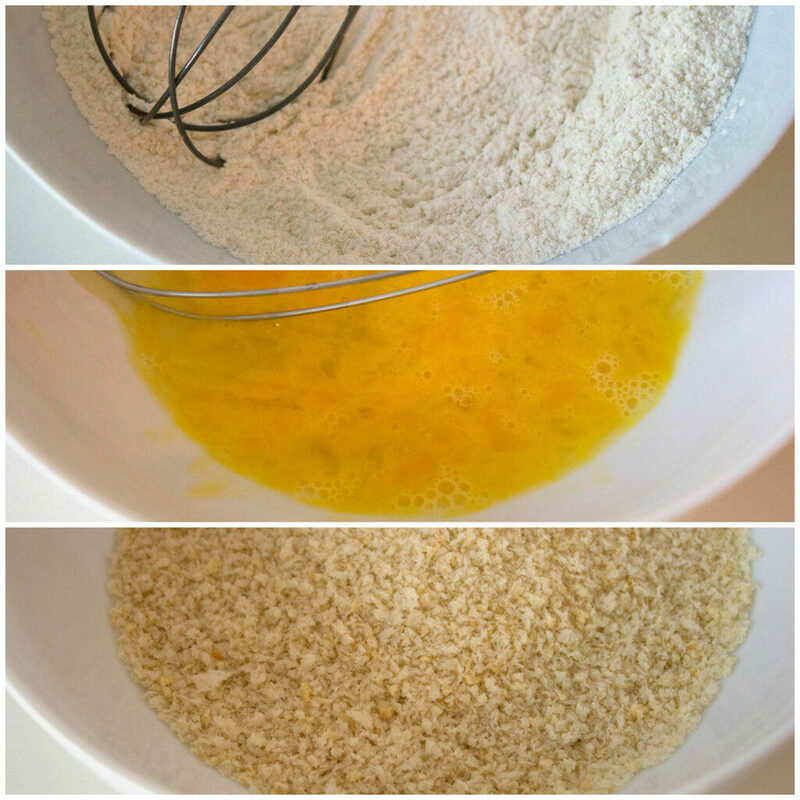 One bowl will contain 1/2 C flour, 1/2 t cumin, 1/4 t black pepper, and 1/4 t salt. Another will contain 2 eggs, lightly beaten. 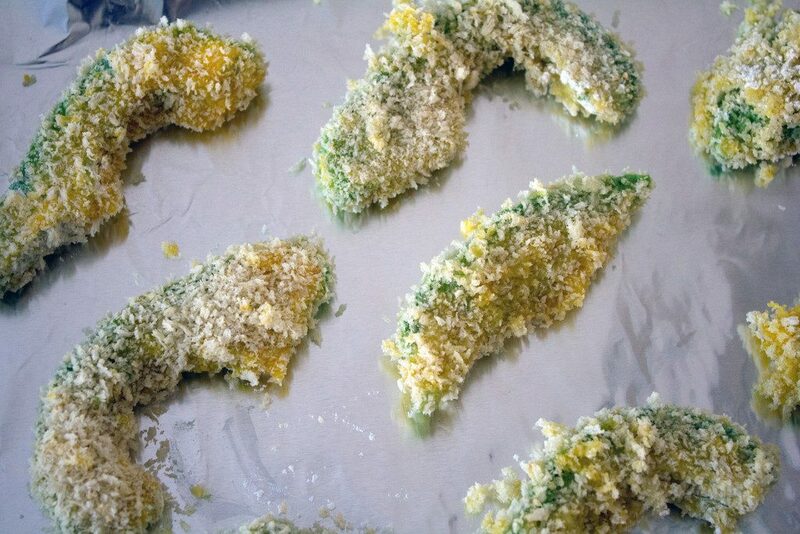 And a third will contain 1 1/2 C panko and 1/2 t garlic powder. 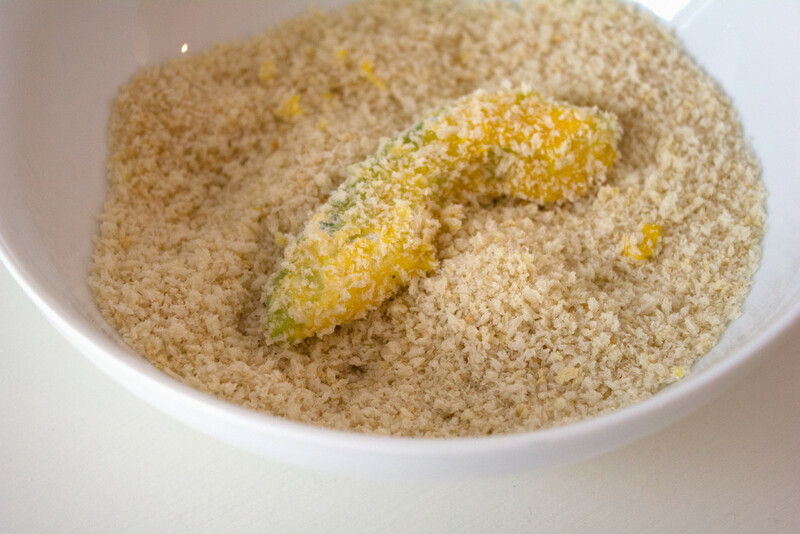 You could use bread crumbs, too, but panko is a tad bit healthier. Dredge the avocado in the flour and then shake a bit to let excess fall off. Then dunk in the egg before coating in panko. As you dredge each avocado slice, lay them on a foil-covered baking sheet. 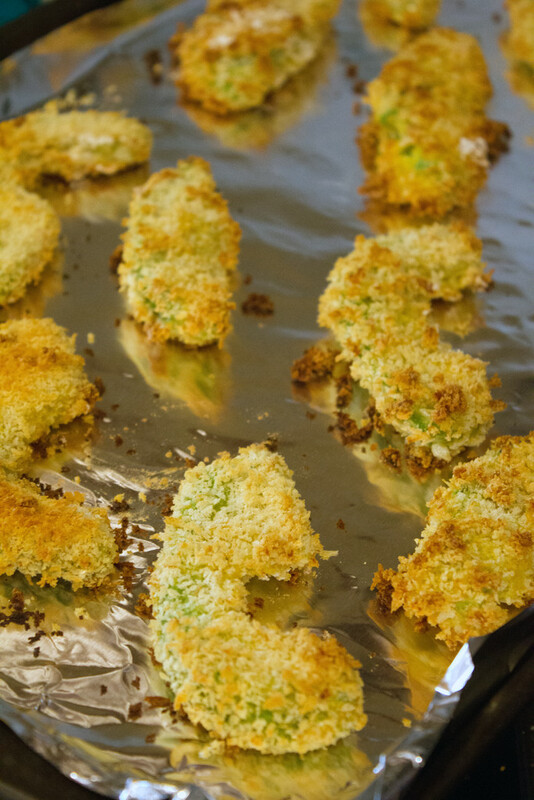 Bake the avocado at 450 degrees for about 14-17 minutes, until the panko is turning lightly golden. 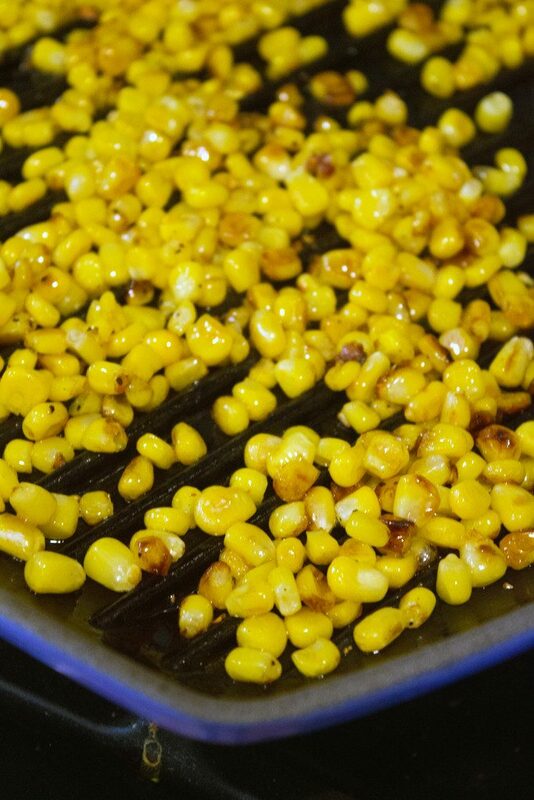 While the avocado is baking, grill up that corn. Or sauté it. I put mine in a grill pan with a little bit of olive oil and let it brown a bit. The yogurt sauce is simple; just stir together plain 3/4 C Greek yogurt (I used non-fat), 1/2 t chili powder, 1 T lime juice, and 1 t milk. And you’re ready to assemble your avocado tacos. 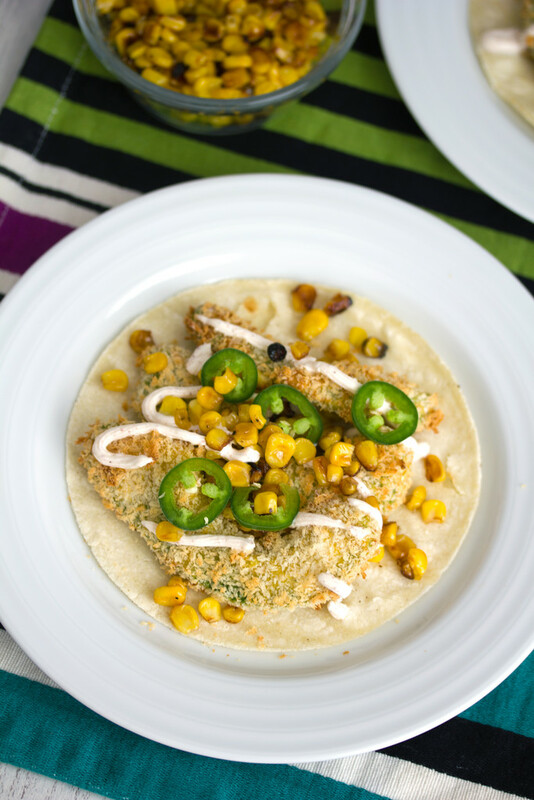 I used corn tortillas, but you could certainly use flour if you prefer. Heat tortillas in the oven or in a frying pan. And then place 2-3 baked avocados on the tortilla. Add corn to the top, along with some sliced jalapeño. Then drizzle on some Greek yogurt sauce. Squeeze a little lime over the top for good measure, if you’d like. Could my love for avocado grow any stronger? I really don’t think so. Then again, I already thought it was at its peak when I tried these. If you’re not super into spicy, you may want to stay away from the jalapeños or chop them up much more finely. 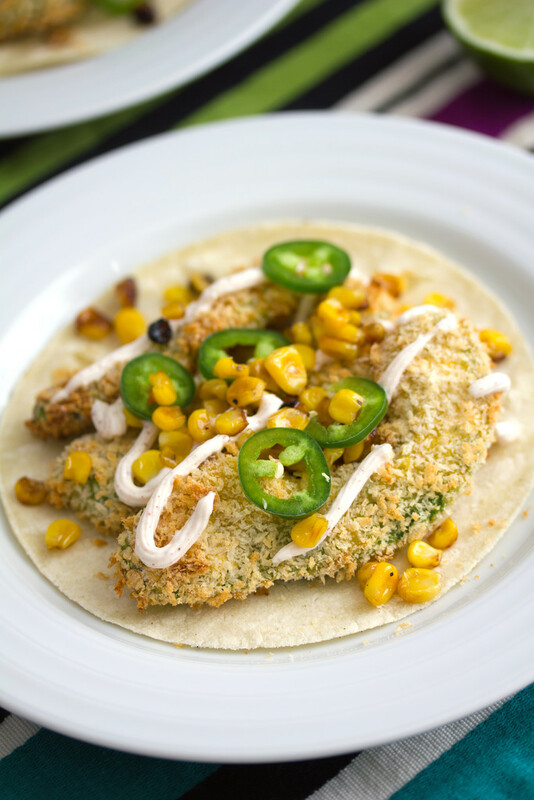 For some reason, I’ve been dreaming about jalapeño tacos for weeks, so I was really excited to add them here. I love the way the spice goes with the mild smoothness of the avocado. Dreamy. No, this is no Mighty Cone. In fact, I filled these little tortillas with so much goodness that I could barely wrap them up. But this is much, much healthier than a Mighty Cone. And it’s perfect to make for a weeknight dinner. No lugging out your fryer or waiting for a pot of oil to reach the perfect temperature. We should probably talk about the corn, too. Hi, this has me all kinds of excited for summer. In fact, I think you should probably take these tacos out to your deck and eat them there. If you don’t have a deck, just go sit in your driveway or parking lot or something. Or at least open a window. Sorry, I think I’m just a little bit giddy because it’s been 60-70 degrees in Boston the last couple of days. Here’s to many, many more spring and summer meals! And a ridiculous amount of avocados (and avocado tacos!) always. Does the thought of an avocado a day make you happy? 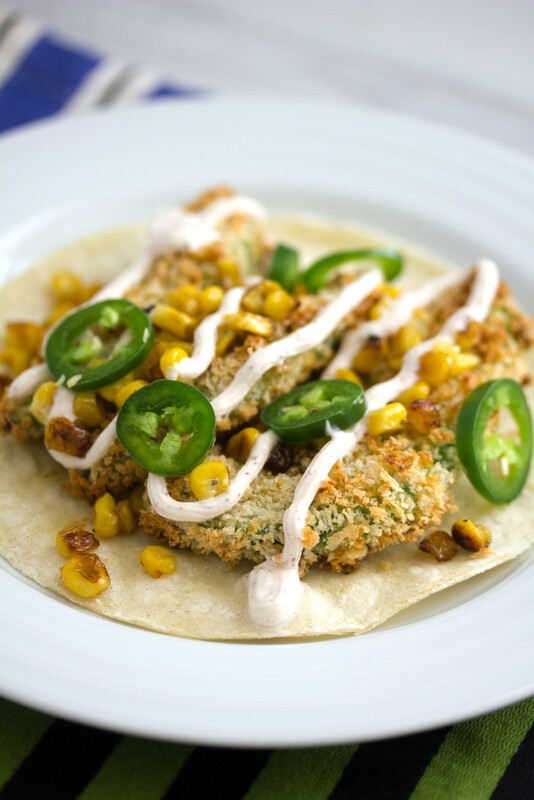 Oven-baked avocados and jalapeños are the stars of these tacos, with grilled corn and chili Greek yogurt sauce in the supporting roles. Easy enough for a weeknight dinner, Baked Avocado Jalapeño Tacos are completely satisfying, even without meat! Prepare a foil-lined baking sheet and pre-heat oven to 450 degrees. In a medium-sized bowl, whisk together all-purpose flour, cumin, black pepper, and salt. In a separate medium-sized bowl, lightly beat eggs. In a third medium-sized bowl, place panko and garlic powder. Dip avocado slice in flour mixture, fully coating and then shaking off excess flour. Then coat in egg mixture and finally move to bowl of panko and full coat. 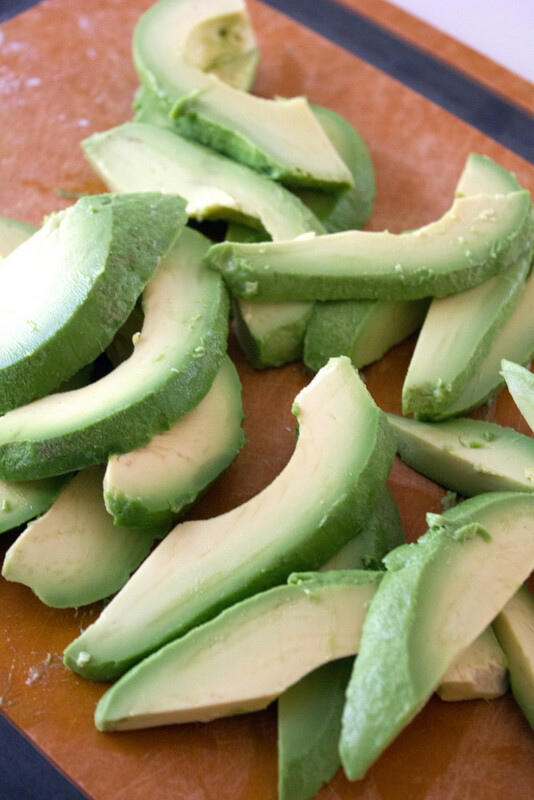 Place on foil-lined baking sheet and repeat with remaining avocado slices. Place in oven at 450 degrees for about 14-17 minutes, until just starting to turn golden. In a grill pan or frying pan, heat olive oil over medium heat. Add corn and cook about 8-10 minutes, until starting to brown. Heat tortillas in frying pan or in oven. Place 2-3 baked avocado slices on each tortilla. Top with corn and jalapeño slices. Drizzle chili yogurt sauce over the top. In a small bow, mix Greek yogurt, chili powder, lime juice, and milk together. 17 Responses to "Baked Avocado Jalapeño Tacos"
Flat out FABULOUS!! TOTALLY!!!! That sums it up in my (cook)book!!! I love these unique tacos! Totally totally need to try these! 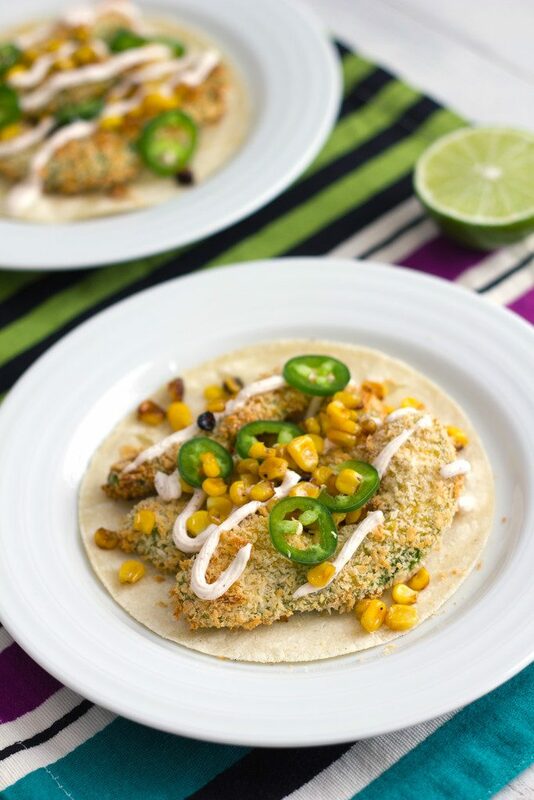 Crispy, crunchy and creamy avocado tacos sound so good! Mmm I love oven-fried avocado tacos! 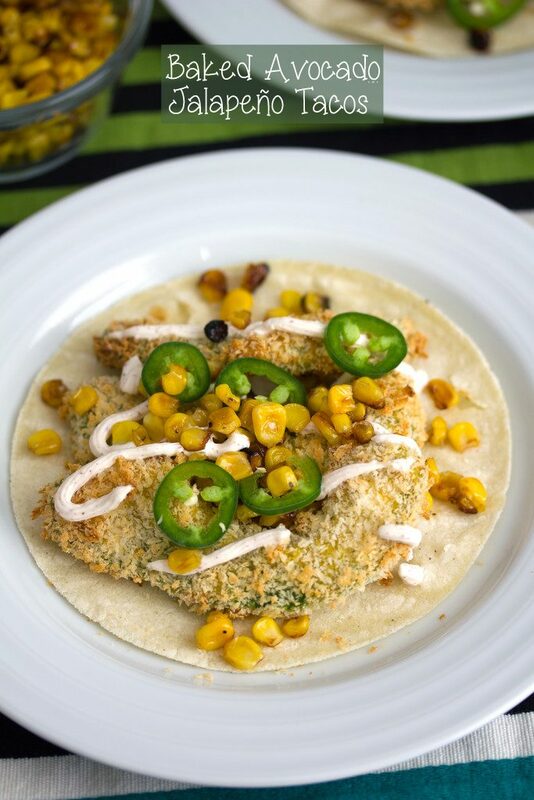 Great idea to add corn and jalapeno. I am on a bit of a taco kick lately, too! It’s so fun to taste something delicious and memorable on a trip. We had some of Rick Bayless’ food in Chicago recently and that was a big ‘wow.’ Oven-baked avocado sounds awesome! Taco perfection! I love the idea of the baked avocados! Tacos with avocados are my favorite! Love the creative twist on these, Sues! I could easily eat an avo a day, but they are very expensive here most of the year as they are not grown locally. That looks delicious! I never thought about roasting an avocado! Can’t wait to try that. Yummy taco, Sues! I love the bangs and the romper! And I would love these avocado tacos too! Now that is my kind of taco! Love the combination of flavors and textures. 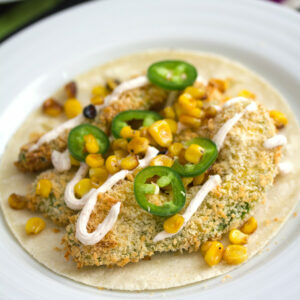 I love tacos, I love Mexican, I love these little beauties! Delicious! Honestly, from the photo, I totally thought they were fried! You got those avocados to the perfect degree of crispy crunchy delicious! Oh yummy! I do like the idea of baked avocados a lot and these look so crispy! Oh yes I do think an avocado a day is an excellent goal! I love them, and this recipe is absolutely amazing. I’ve never ever thought about a baked avocado, dredged or otherwise. 🙂 And in a taco? Heaven! First of all that picture of you Sues is simply gorgeous and secondly I have been wanting to try baking avocado fries, so a big thank you for perfecting that!! Need to try these!